In the winter of 2013, a group of sociologists decided to put together a general portrait of those who participated in the Euromaidan. Over the course of two days, December 7 and 8, 2013, they talked to protesters in the centers of Kyiv and Lviv. On Sunday, December 8, the largest rally took place after the night-time beating up of students that had taken place a week earlier. In two days, the pollsters talked to 443 people. The results of this study were later published on the Ukrainska Pravda site by one of its authors, Oleksiy Shestakovskiy. As he explained it, the survey used the methods of the European Social Survey, which made it possible to compare the values of Euromaidan folks with the values of the rest of the population of Ukraine and of other countries where surveys are carried out using this same method. The priorities the protesters themselves expressed were universalism and goodwill, as well as independence and security. The lowest on the scale for them were personal power and wealth, as well as conformism and hedonism. The survey reveals that the values of the Euromaidan protesters were far closer to the residents of Northern Europe than to most of their fellow-citizens. Over the following two months, many an event took place that would completely overshadow the vicheor massive town hall of early December. The first attempt to storm began during the night of December 12, in late January the first protesters were killed, and the entire Maidan ended in the mass shooting of protesters almost exactly a month later. To portray the values profile of those who kept climbing Instytutska under the bullets of the Alfa sniper team on the morning of February 20 is no longer possible. Similarly, we cannot determine exactly how much they had shifted from the Europtimists in early December. The 2013 survey is possibly the only attempt to generalize how those who participated in the Euromaidan differ from the rest of the population in terms of values. And it did point to some significant differences. It’s another question, though, how much the people of the Maidan were able to influence the rest of Ukrainian society over the following five years. This is also extremely hard to determine as, right after the Maidan came the war. Still, in evaluating the specific impact of the Maidan, what The Ukrainian Week’s interlocutors focus on is the activation of civil society. 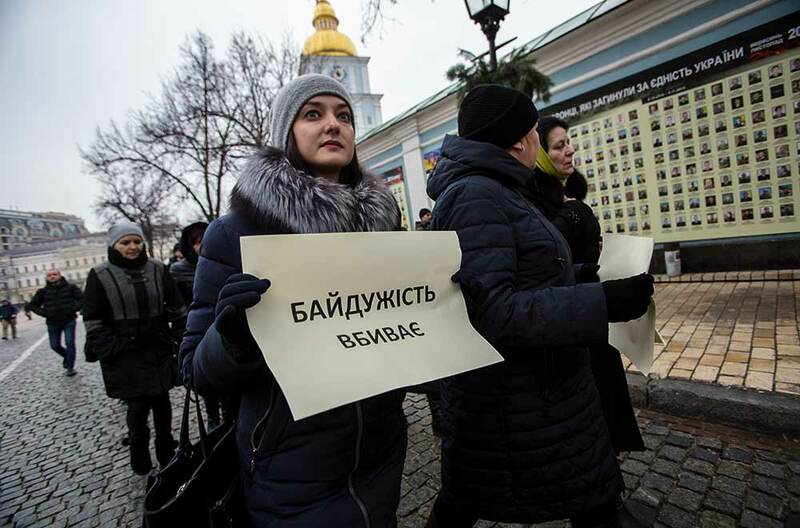 Bekeshkina says that all those years, the government had to take into account the presence of the civil society that arose during the first Maidan. Quite a few changes actually took place in Ukraine thanks to its activity. The pollster brings up the example of mandatory e-declarations or the current judiciary reforms taking place under the supervision of the Civic Integrity Council. Her colleague at KIIS, Paniotto, notes that the strengthening of civil society can be seen in polls on trust in different institutions. The top places go to the volunteers, the church and the army. Next come civil society organizations, in whom the trust level has grown in the last few years. According to Paniotto, these changes are clearly one of the outcomes of the Euromaidan and the war. Prior to 2014, the top two were the church and the press, with civil society trailing a distant third. At the same time, broad swaths of the population may recognize the merits and achievements of the activists, but they don’t bother to change themselves. In any case, this is true of civic engagement. In 2015, DIF asked respondents to answer two questions: one about society in general and one about themselves. For instance, when asked “Do you think ordinary Ukrainians have become more inclined to join public organizations and initiatives in the last two years?” more than 50% saw positive change, but less than 18% felt such a shift in themselves. More than 40% saw growing focus on civil action in society, but only 13% felt this in themselves. Indeed, the pollsters recorded the same gap between perceptions of society around them and themselves for almost all questions in the section on civic activity. The main changes that are noticeable in the public mood are mainly connected to the country’s foreign policy vector: attitudes towards the EU, NATO and Russia. The Ukrainian Week’s interlocutors point out that there are a number of important nuances on this issue. Paniotto also points out that changes in attitudes depend on where a survey is carried out: “We don’t do polls in Crimea and very rarely in occupied Donbas. One of the main changes we see is in attitudes towards joining the EU and NATO. Our survey results suggest that about a third of this is tied to change of territory.” He adds that if there were a referendum on accession to the EU today, then about 80% of those who turned out to vote would favor joining. Similarly, Ukrainians would support joining NATO, but with a much smaller margin. Today, Paniotto says, the latest results of this survey are available. On the whole, the situation seems to be staying generally stable, but in some areas it is worsening. For instance, in Kharkiv and Odesa Oblasts, nearly half the respondents support Russian propagandist statements. Bekeshkina confirms this, acknowledging that a large part of the public actually blames the Maidan for what came after –the annexation of Crimea and the war in the Donbas. According to her, this is even true of people who previously supported the protest. But it’s early to draw final conclusions about the impact of these events on Ukrainian society – at least until the surveys include those who in February 2014 were still going to kindergarten or sitting at their desks in public schools.